Spring is farm improvement time. Concrete pad and pallet wall. 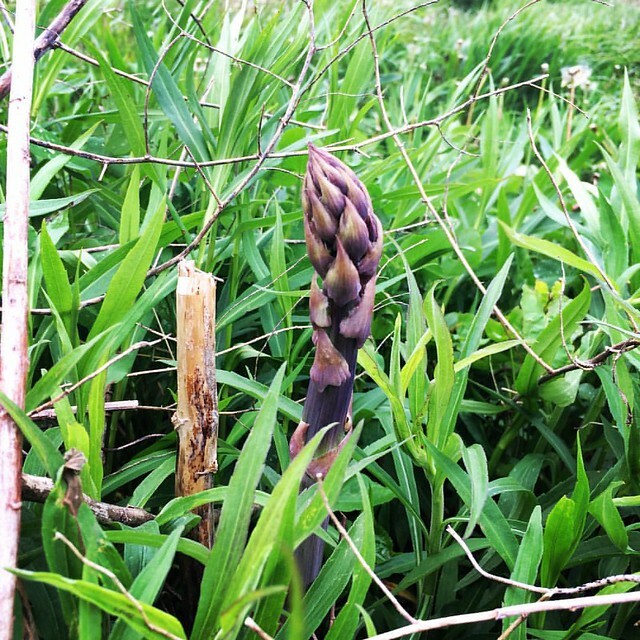 Keeping fertility on the farm. 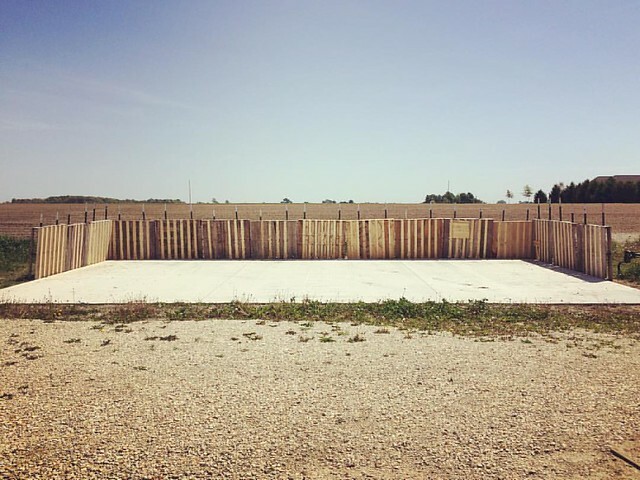 Or, as we joked when we were putting it together, this wall is to keep manure in – not to keep people out. 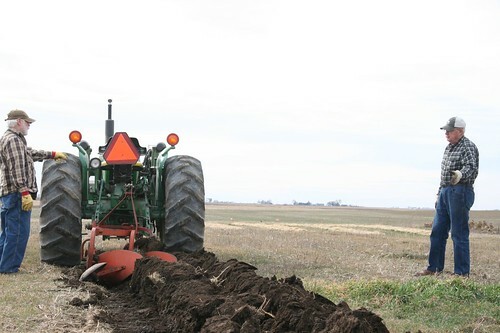 The moldboard plow makes a furrow that we put the right tractor wheels in to do the next swipe, so we remove the dual (second/outside tire) on the right side. 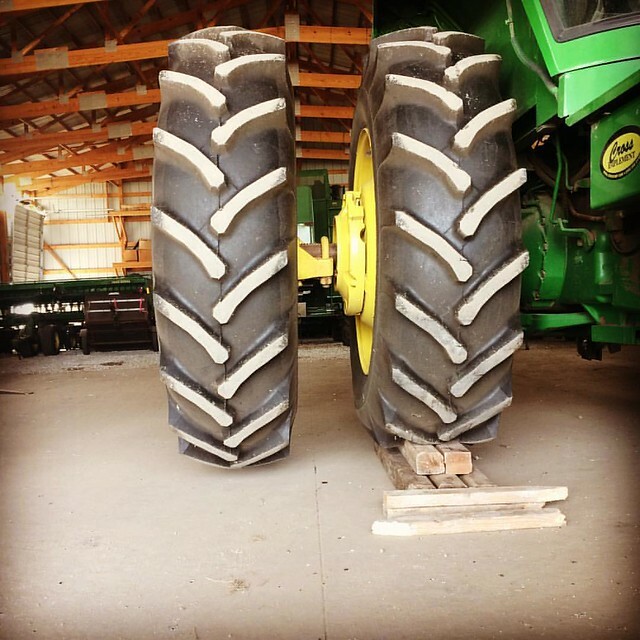 We want all the float and traction we can get, though, so we leave the left one on. It looks funny, but it works! Finally, a real winter! By which I mean a winter like the ones I remember from my childhood in the ’80s, with plenty of snow that stays on the ground for a long time. Enough for skiing and snowshoeing, enough so that you work up a sweat when you’re shoveling. “So…what do you do in the winter, then?” I’ve been getting that question a lot in the last month or so. 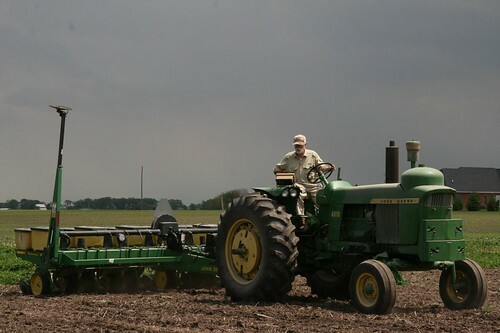 I like to answer, “Catch up on the weekends I missed during the growing season.” But really, there never seems to be a shortage of things to do. 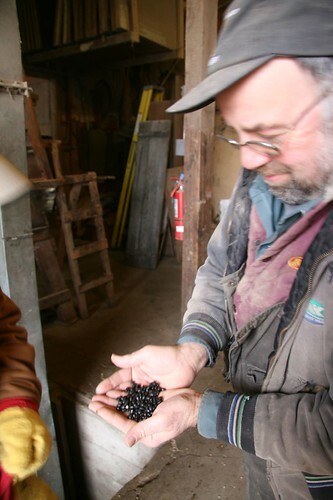 The most urgent winter work on the farm is selling and delivering or shipping the beans and grains we grew during the previous season. This also means keeping the grain in good condition, climbing up to the top of the bins on nicer days to test the moisture and using fans as needed to move air through it. 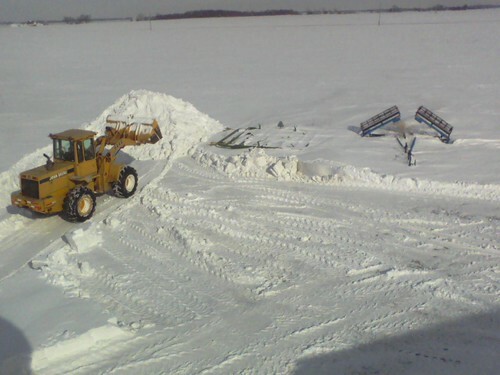 We didn’t get all of our commodity-level grains sold before the snow came, which means we spent quite a bit of time preparing for truckers, and then plowing again (or having someone bigger plow) when the weather changed and they couldn’t make it. Thank goodness for our farm supply co-op and their giant payloaders! 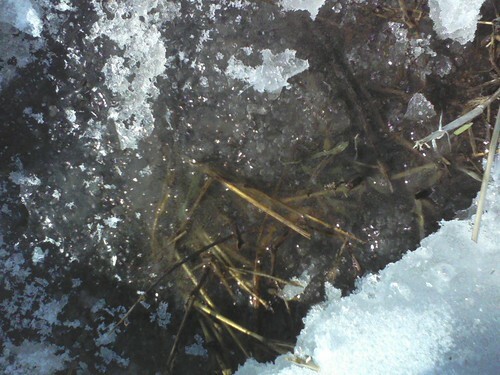 Can you see the green of the winter wheat beneath the layers of snow and ice? 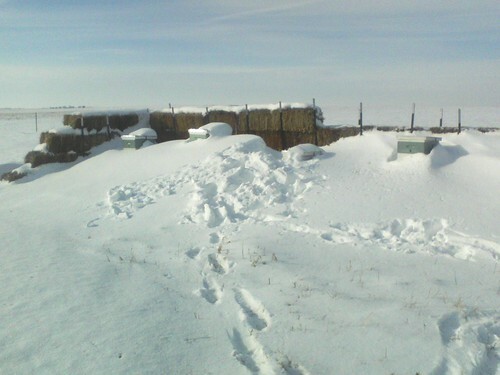 We shoveled out the beehives a couple of times, but only as much as necessary, as the snow acts as a nice insulator. Fortunately we had left an opening at the top of each one so that the bees could get out to do their business. 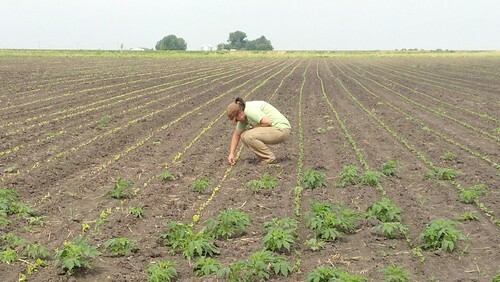 We also spent some time learning from experts, including a soil science seminar put on by Midwestern Bio-Ag, a webinar about dry bean production, and a talk by Seed Savers Exchange co-founder Diane Ott Whealy. 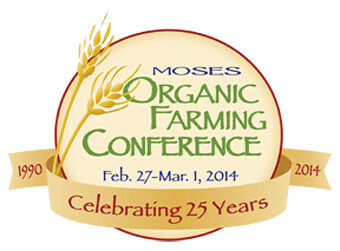 The MOSES Organic Farming Conference in LaCrosse at the end of February is always a highlight of our winter, and this year was no exception. Molly attended workshops that shared new research on perennial grains, heirloom small grains, and dry bean breeding. 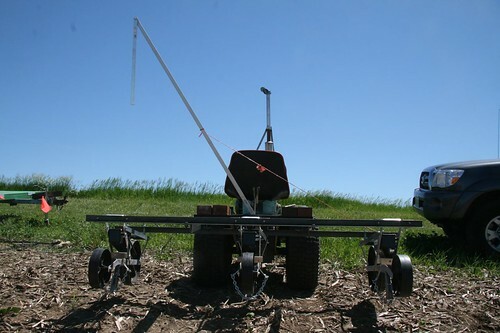 John delved even deeper into soil science, weed control, and equipment options. These sources of inspiration carried us through the more hum-drum paperwork of winter. Taxes, cost accounting, budgeting, crop insurance, farmers’ market applications, organic certification, grant-writing. When we needed a break from those, we shoveled some more. Or moved some compost, ordered seeds, or shopped for “new” (used) equipment. We also started compiling a reading list on our website, partly for us and partly for you. Andrea from Hazzard Free Farm (left), Vicki Nowicki, a long-time Seed Savers member, me, and Terra Brockman (right), founder of The Land Connection and author of The Seasons on Henry’s Farm. Along with paperwork and shoveling, this “real” winter also gave us time to rekindle our seasonally-neglected friendships. A friend recently organized a Soup Swap get-together, where each person brought several quarts of frozen home-made soup and traded them for others’ soups. Trading took an entire evening and several bottles of wine, and I came home with a freezer filled with a lovely variety of soups for every mood and meal. 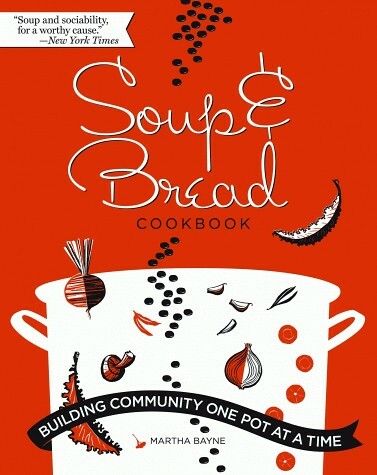 Continuing with the soup theme of the winter, I later cooked up several gallons of soup for one of my favorite events in Chicago, Soup and Bread at the Hideout. It’s a free soup dinner, open to everyone, at an unassuming bar in a funny little corner of the city. Any donations received are directed to a local charity, usually one related to food or hunger. The theme for our soup night was “Mac vs. Cheese,” so I made a soup I called Grandpa Mac’s Minestrone with all the local ingredients I could muster, including our red beans, pasta made with our wheat, and a bunch of storage vegetables from our garden. 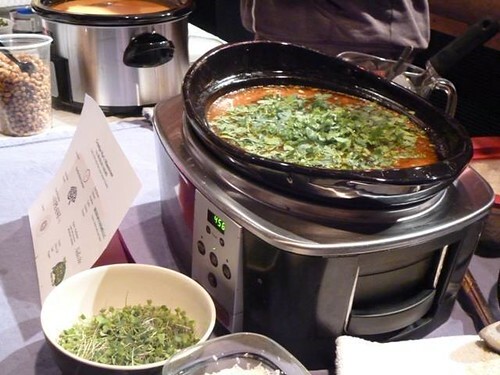 Grandpa Mac’s Minestrone – photo thanks to Inspiration Corporation, the beneficiary of our soup night. An upstart group of local farmer friends got together last year to start the Band of Farmers, a coalition of CSA (Community Supported Agriculture) farms who joined forces to educate folks about CSAs. 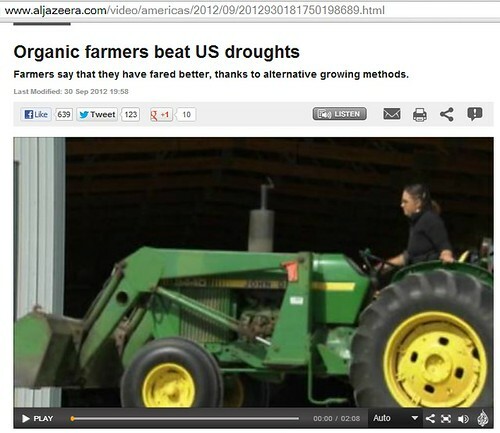 I worked with them through my side job as the coordinator of Earth First Farms’ organic apple CSA. 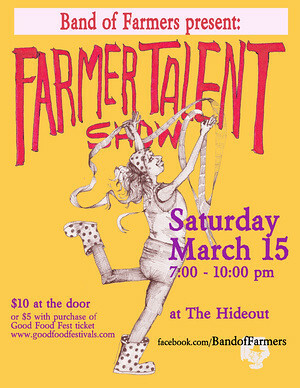 The group ended up creating a Farmer Talent Show, which I can assure you is just as awesome as it sounds. This year for the Second Annual talent show, I once again coordinated the Farmer Fashion Show act and modeled my quilted lined coveralls. Some years we have done our frost-seeding in January or early February, but this year the snow didn’t melt until March, so we squeezed it in just before the warm weather hit. We’re also a bit behind our usual schedule on seed starting, but the onions are up and the slowpoke heirloom peppers are next on the list. The good news is that spring is on the way! 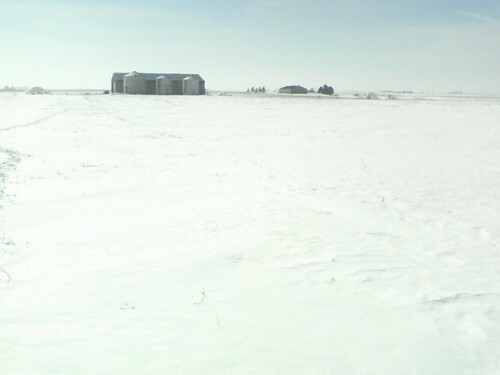 But we sure have been enjoying having a real winter on the farm. We have been wanting to learn more Spanish for a while now. We work with some Spanish-speaking folks, we grow native American crops that are still traditional foods in many areas that are now dominated by Spanish language, and our 2012 trip to Cuba would have been even more educational if we had a better command of the language. And let’s face it, if there’s one non-English language that is useful in the US, it’s Spanish…our years of French, Latin, and Greek are great, but we don’t find ourselves using them very often here in the Heartland. After several years of watching and testing out the recipes from Chicago Chef Rick Bayless’s PBS show Mexico: One Plate at a Time, John & Peg finally decided to try to find a language school and some good food as a way to skip the winter doldrums. After quite a bit of research, they settled on Oaxaca (pronounced wa-HA-ka), the capital city of the Mexican state with the same name. 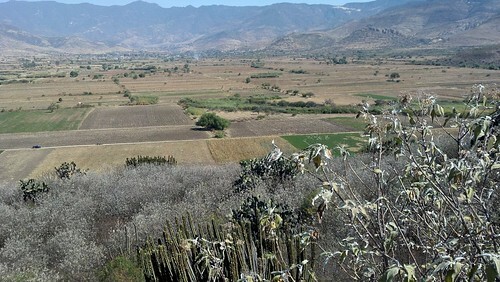 The state of Oaxaca is near the southern tip of Mexico, and its capital is in an inland valley at about 5,000 feet above sea level. 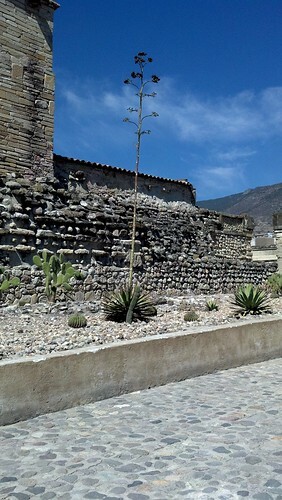 The area in and around the city of Oaxaca offers a fascinating view of both pre- and post-colonial civilizations. It had all the things they were looking for: a highly recommended language school, delicious local cuisine, and a State Department “ok.” They got the recommended vaccinations, signed up for classes, and reserved a room in a B&B in the heart of the city. They arrived in January with only a few basic words of Spanish, eager to learn. The valley was checkered with small and medium-sized fields growing both traditional and modern crops. Everything turned out to be even better than they’d hoped. The B&B was a beautiful, environmentally responsible place filled with interesting visitors from around the globe who returned year after year. It was easy to get around, the food was amazing, and the Oaxacan people were patient and friendly. They threw themselves whole-heartedly into their studies at Amigos del Sol, the language school. Class began at 9am every weekday, consisting of lessons on verb conjugation, sentence structure, and vocabulary. Peg stayed for 3 hours, and John stayed on for an extra hour and then had a separate conversation session in the evening with their teacher. The one-on-one conversation allowed him to learn about agriculture – both the Spanish vocabulary words and how it is practiced in Oaxaca. 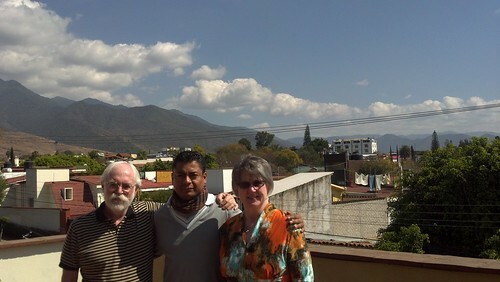 Peg & John with their Spanish language teacher, Celso. Since we grow corn and dry beans, both native New World crops that were first domesticated not far from Oaxaca many thousands of years ago, they had a special interest in learning about the modern and historical uses of these foods. In addition to making an effort to eat traditional local cuisine (the one night they ventured into an Italian restaurant was the only time they had a sub-par meal), they were also able to attend a tortilla-making demonstration (left). Later on in the trip, Peg took a cooking class with a renowned local chef. While they didn’t make the mole sauce which is a local delicacy (it has 28 ingredients and takes more than 24 hours to complete), she came away with many tips, tricks, and flavors. 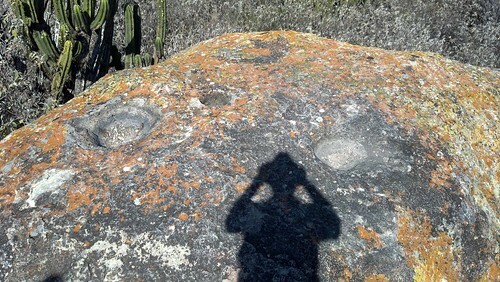 One of their weekend visits to historical sites took them past a rock with several strange holes carved out of it. Their tour guide explained that this rock was used to grind corn in the traditional manner before modern stone milling. 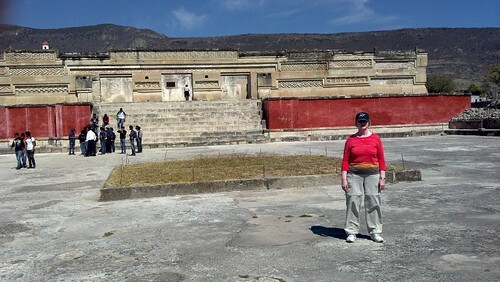 These basins were hollowed out by thousands of women’s hands, grinding corn kernels into flour for tortillas. With tips from their language teacher, they did find several varieties of hard-to-find purple bean seed and some delicious spicy peppers. 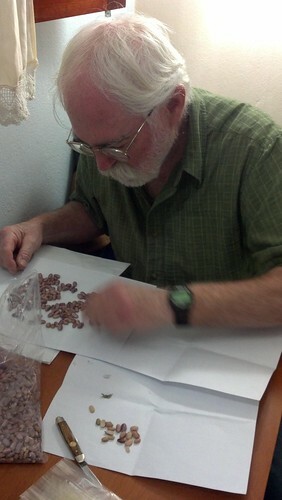 John sorts seeds from the farmers’ market for import. 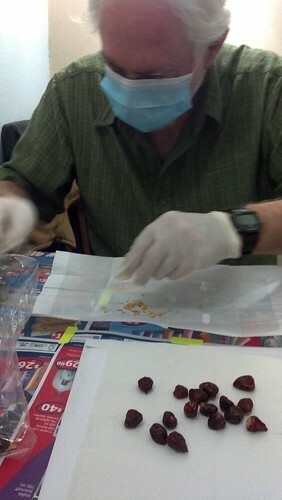 The bean seeds (left) had to be checked individually for insects, and the dried hot pepper seeds (right) are so spicy he wore a mask and gloves to protect himself. After spending hours painstakingly separating and cataloging the seeds he’d selected to bring home, John was appalled when his luggage went through the x-ray scanner with everything else. 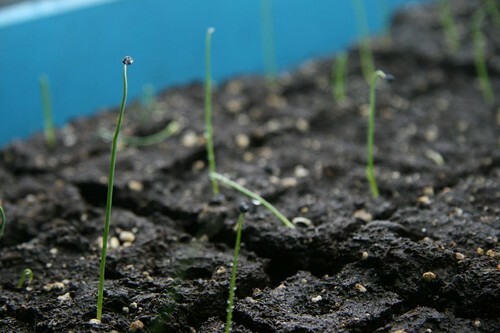 Fortunately, germination tests back at home have shown that the seeds are still viable. Whew! 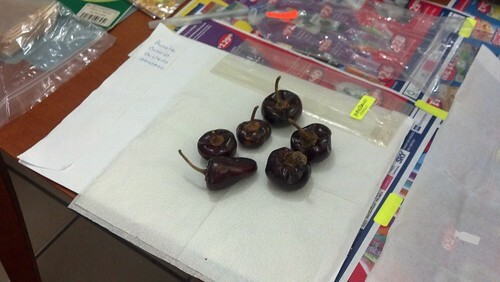 A favorite pepper that Celso had tried to bring to his aunt in Los Angeles on a previous visit but had been rejected due to lack of paperwork. John hopes to be able to get her the seeds for this year’s garden. This is just a tiny snapshot of the places my parents went and the things they learned this winter in Oaxaca. 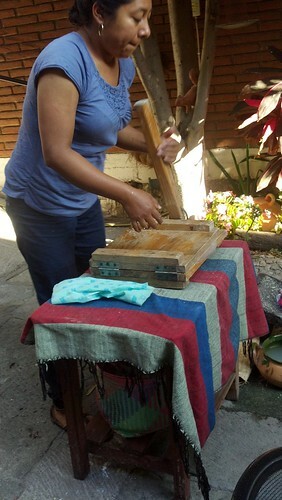 I haven’t even touched on the visits to the traditional mezcal factory (also spelled mescal, this traditional liquor is made from agave, right) and the rug weaving villages (many brilliant traditional dyes originate in this area). Or the artisanal salsas, the religious celebrations, the old (500 years ago) and ancient (5,000 years ago) structures that they visited. I can’t capture the excitement in my dad’s voice when he called the first week to tell me that he’d gone to the pharmacy and had been able to describe the problem he was having, and get a prescription, all in Spanish! But I can say that before they were halfway done with their trip, they were already planning dates for next year and trying to convince me to come down for a bit. Now, two months later, they’re still studying Spanish every day with Duolingo, a free online language learning game. Did I mention that my dad celebrated his 70th birthday while they were there, traveling unguided in a foreign culture with next to no basis in the language? Pretty awesome. Soccer ball markings on a native Oaxacan pollinator. 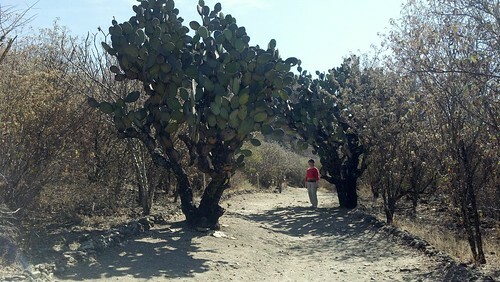 Peg stands under a nopal cactus arch. 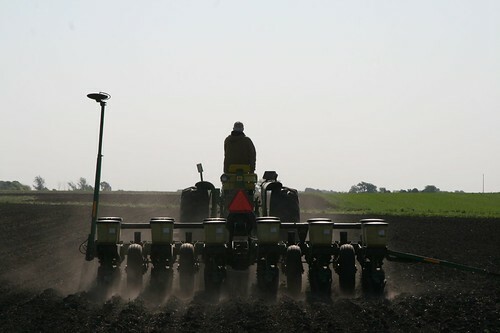 When we started growing dry beans, we used a one-row push planter to plant a quarter of an acre. With the help of our friend Clare, we picked the pods off the plants by hand, laid them out on a tarp in the garage, and stomped on them with clean boots. We lifted as much plant material as possible off the tarp, leaving the beans behind, and then poured the beans in front of a fan to winnow them. None of those beans were eaten, as I recall. I was under strict orders that they were for seed only, because buying the seed was prohibitively expensive. 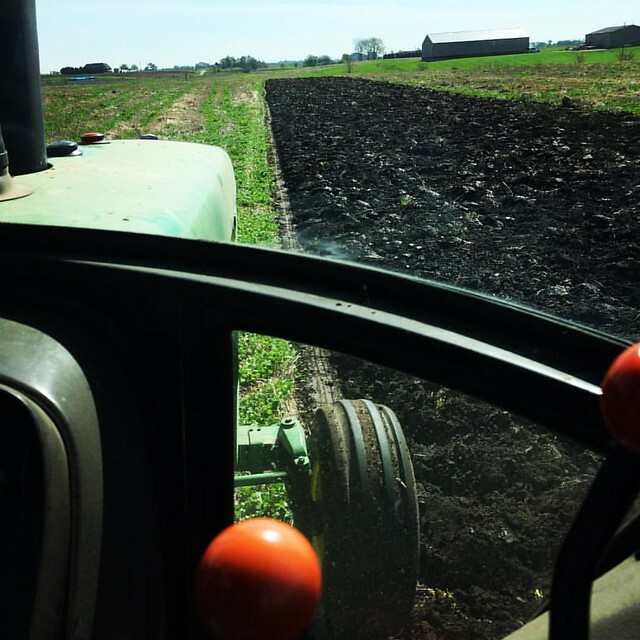 The next year, we planted about four acres with three one-row push planters that were cleverly mounted behind our 14hp garden tractor. The planters only cost $89 apiece, but that meant that the beans got stuck in the plastic plates fairly often, and there was a lot of hopping on and off the tractor to unstick them. 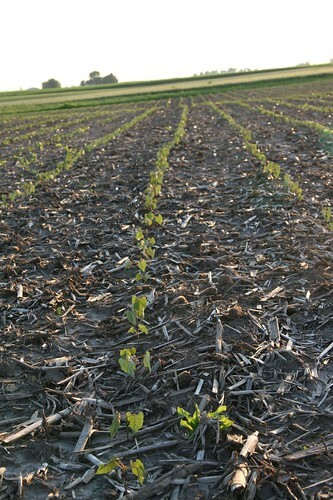 The rows weren’t very straight (due to an inexperienced operator), but the beans flourished. 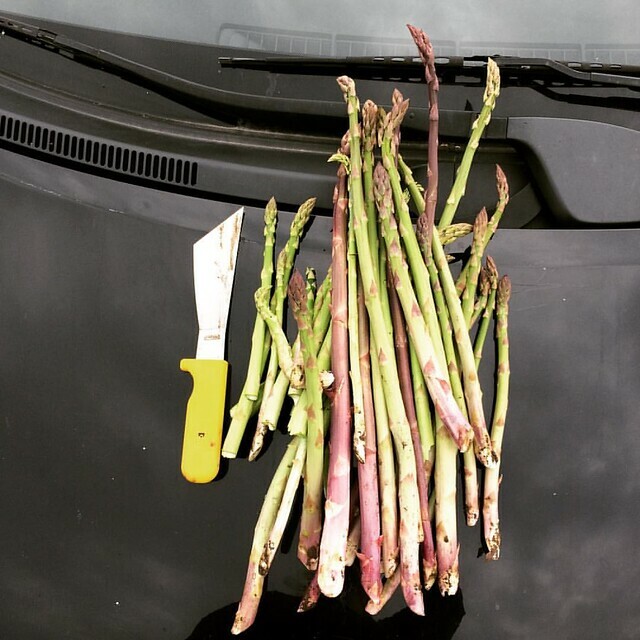 When they were dry, we harvested them by cutting the whole plant off at ground level by hand with garden clippers. Then we fed them through a modified wood chipper to thresh them. 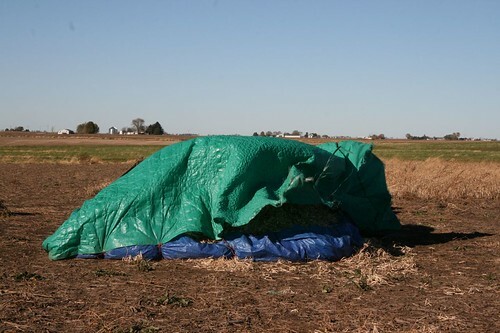 When some guys we had hired to help with the harvest expressed their horror at how many beans were broken by our home-made thresher, we tried their method: we laid out the plants on a tarp and beat them with pitchforks, flipped them over, and beat them again. 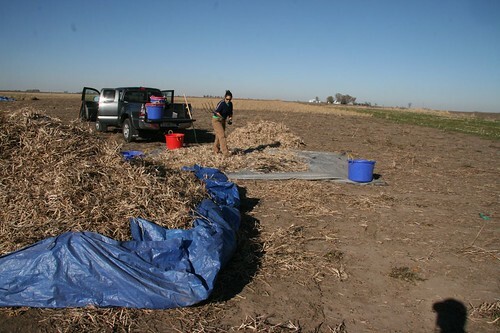 Then we lifted the plants off the beans, lifted the tarp and poured them into buckets. The guys were right – we lost far fewer beans. 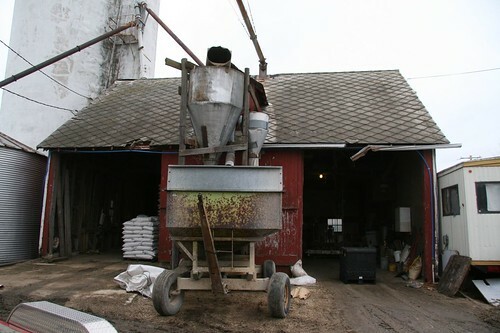 From there, we fed the beans one scoop at a time into a winnower made from an old furnace fan and some ductwork. 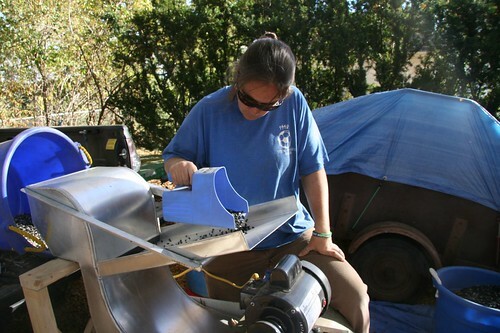 The fan wasn’t very adjustable, so after that, we did a “finish cleaning” which involved pouring out half a cup of beans at a time on a cookie sheet and using our nimble fingers to pick out the broken beans, weed seeds, and anything else unsavory. Several hundred pounds and many, many hours later, we decided maybe we should look for another solution. 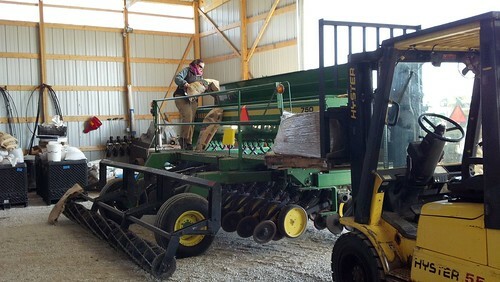 Help came in the form of Larry Gorenz at Kaneville Feed & Seed, a seed cleaning operation about an hour from the farm. We took about 1500 pounds of beans up to Larry on our trailer on a nice day in February, and he ran them through his cleaner. As they ran through, the beans looked great. After the beans came out of the cleaner, they were funneled into a pit under the floor and moved by vacuum to a hopper overhead so that they could be loaded back into our hoppers. 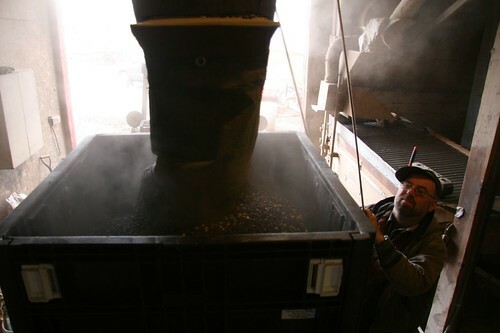 Moments after this excited picture was taken, loading cleaned beans into the hopper, we realized that we had a problem. 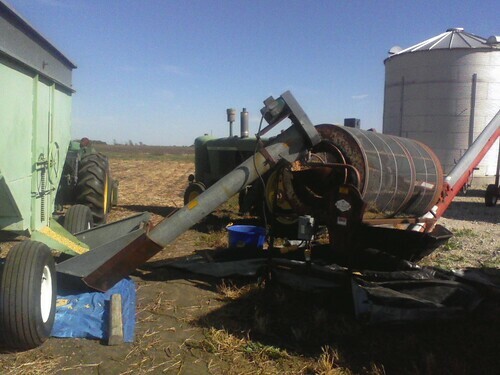 The equipment that moved the beans around the Kaneville seed cleaning operation broke a lot of beans. We were losing maybe 25% of the beans to breakage after they had been cleaned. The solution for that day was to re-clean the beans with me kneeling on the concrete and catch the beans in 5 gallon buckets before they fell into the pit, handing them off while swapping buckets with my dad and Larry. It’s a good thing we didn’t have many beans with us that day. This was not an experience that any of us, Larry included, wanted to repeat. 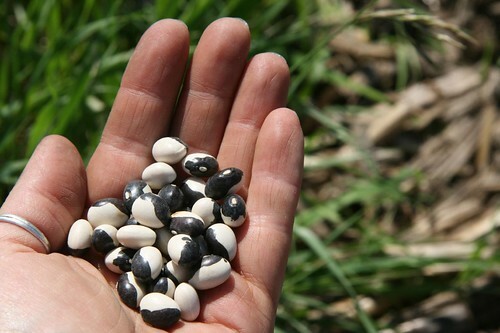 We did manage to sell all of the beans we harvested except the ones that we saved for seed, but we didn’t take any of our harder-to-find, more precious heirloom beans up to Kaneville for cleaning – those we did entirely by hand. It took us 2 1/2 months to harvest 2 1/2 acres of beans. 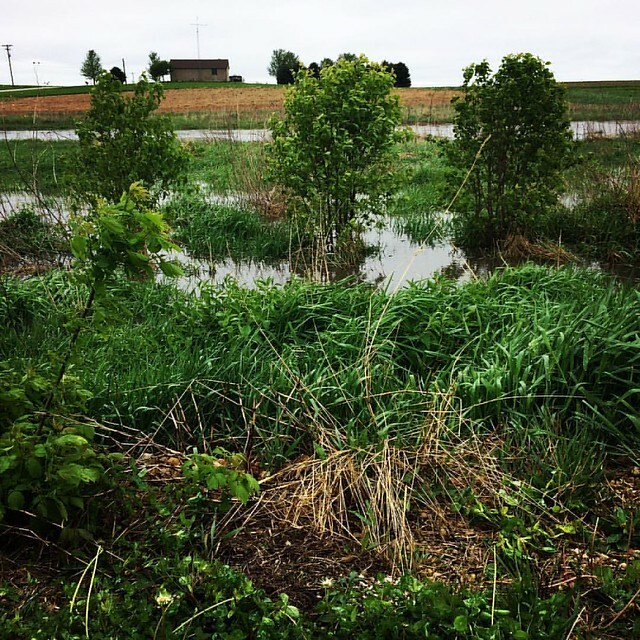 We ended up leaving about an acre unharvested because we just didn’t get to them. Whole bean plants stored under tarps in the field, awaiting threshing. Beans left in the field too long were no longer usable. We tried to make do with what we had at the beginning, hoping to avoid too many costly equipment investments. As we processed more and more beans, though, it became clear that we would have to find some equipment that was better suited to the work we were doing. Packaging with a 16-oz scale. So the next year, 2011, we bit the bullet and scaled up. 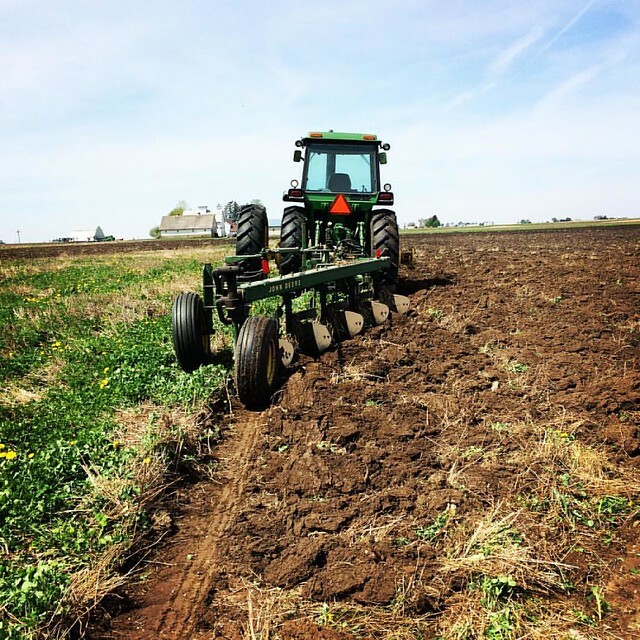 We bought a used 6-row planter and borrowed a tractor to pull it. 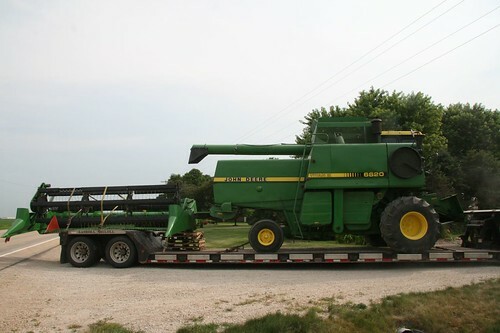 We found the same kind of combine that my uncle Johnny had used when I was born. 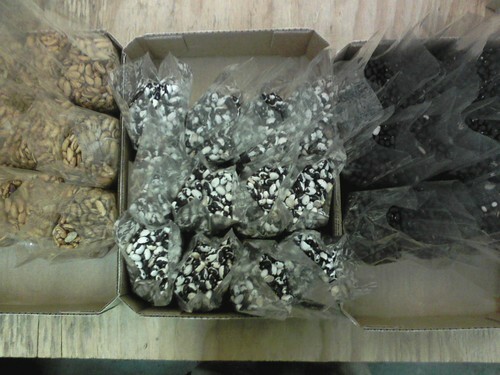 We got a digital scale, and we ordered bags and a bag sewer so that we could package fifty-pound bags. When it was time to harvest beans in 2011, we picked 2 1/2 acres in as many hours; the year before, it had taken us 2 1/2 months to harvest the same acreage. The cleaning, though, was still a problem. All winter long, we sat in the workshop (heated, thank goodness), pouring out beans half a cup at a time on a cookie sheet and picking through them. My dad started to hate Merle Haggard because that’s what we listened to while we worked…Merle meant cleaning beans. Ugh. So in 2012 we decided that the cleaning had to be mechanized. 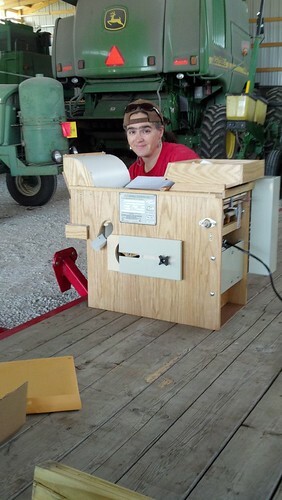 Our budget was small, so we got the smallest mechanized cleaner from A.T. Ferrell, the maker of Clipper seed cleaners. It was called the Office Tester, meant for use in laboratories. 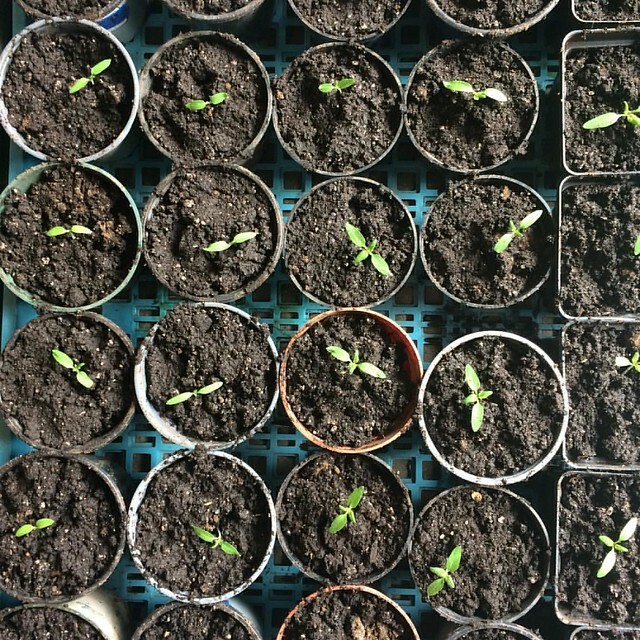 The folks at Seed Savers Exchange said that’s what they used, and that we would be able to clean thousands of pounds with it. When it came, it was even smaller than I expected. Looking dubious about the capacities of the new little Clipper Office Tester (right). With some modifications, we managed to get up to the high cleaning rate of 1 bushel per hour. I spent hours scooping beans out of the big storage hoppers into tubs, and then feeding them one scoop at a time into the top of the cleaner. After two scoops, I would stop the cleaner to clear the partial beans and weed seeds that were stuck in the screens. It took all winter to clean our 2012 harvest, and I could only handle doing it for 3 or 4 hours a day before I got either too cold or too bored. But it worked! Beans, bagged for sale as a “holiday heirloom trio” mix. 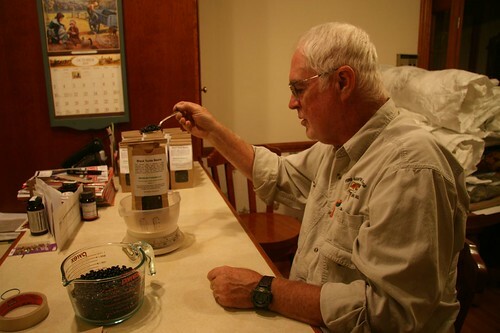 In 2012, we grew about 6,600 pounds of black beans. We had to stop delivering to our restaurant customers in January or February, and by July we didn’t have any beans left for farmers’ markets. We estimated that we needed to grow 10,000 pounds just to be able to supply our (then) current customer needs, and more if we were to be advertise elsewhere. There was no way that I could clean two to four times as many beans on the sturdy little Office Tester and get everything else done on the farm (and keep my sanity!). Read on to learn about the solution: Cleaning Beans, Part 2. 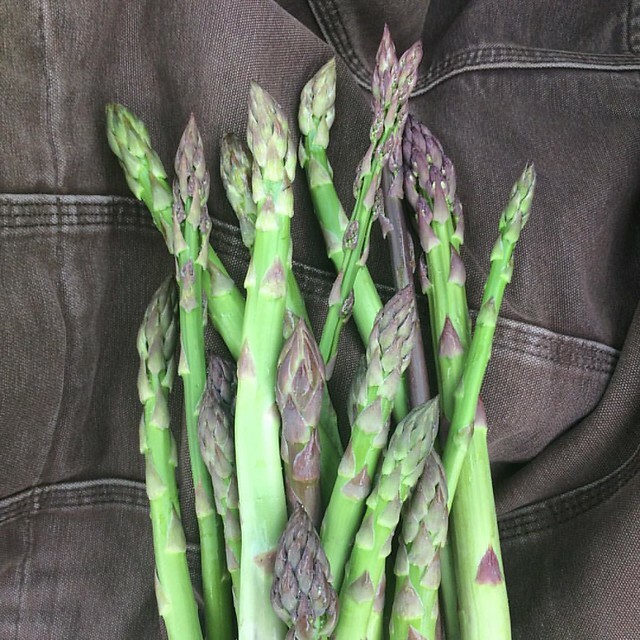 On our farm, we focus on grains and beans, but we also dabble in vegetables. 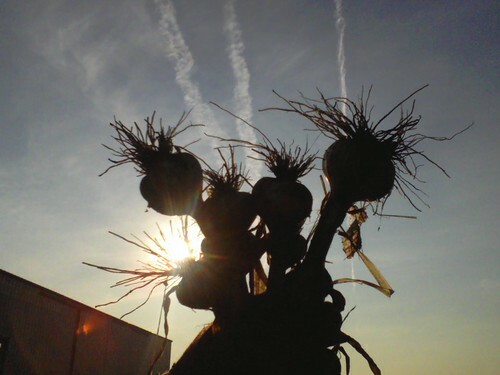 Our “Research & Development” garden has produced one commercial crop so far, delicious hardneck garlic. 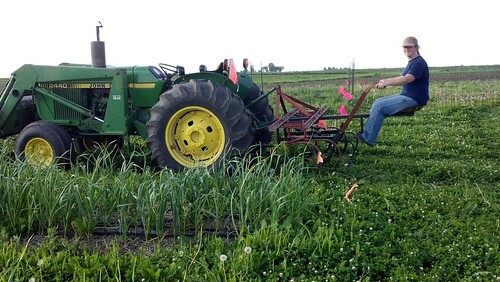 We harvested the scapes from our 5,000 heads of garlic in June 2013. We use the garden to experiment with cover crops on a small scale: this year, we tried buckwheat and mustard. It’s quick and easy to broadcast and roll in just an eighth or a quarter of an acre, and we get to see the effects first-hand without too much investment. 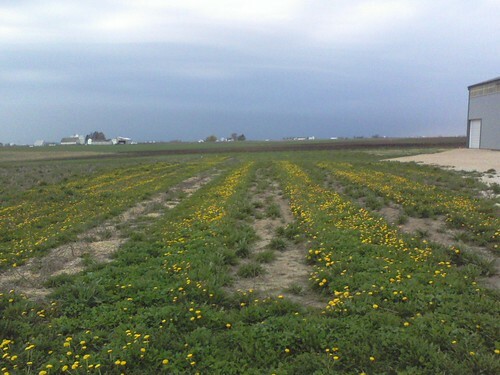 The mustard cover crop is mowed during flowering to prevent re-seeding. There’s an ongoing pepper experiment in the garden, where this year we planted several varieties of hard-to-find heirloom peppers for seed. 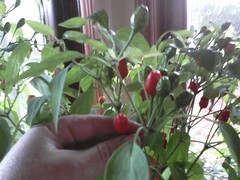 The tiny, very spicy Texas chiltepin pepper (right) had to be moved indoors at the end of the season. 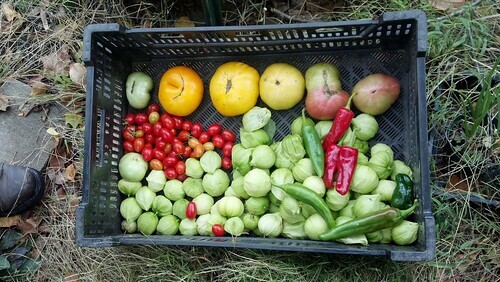 So while we have several other vegetables in the garden, research is a slow process, and the edible outcomes often end up being mostly a tool for expressing goodwill: something we share with workers, neighbors, and friends. And, of course, eat. 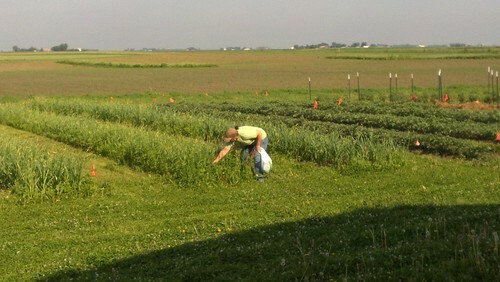 Research is important, and goodwill is essential to our farm’s survival. 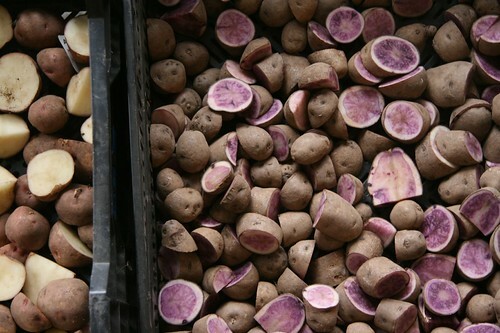 The potatoes, though, are planted for larger reasons: family, history, love, and memory. My dad’s paternal grandfather, Peter Breslin, was born on a farm in County Donegal, Ireland. At the age of 16, he and his younger brother Frank (age 14) left their home to emigrate to the United States. It was a passage initiated not by excitement and adventure, but by necessity: land and employment were scarce, and children were plentiful. They had to make their own ways in the world. While he never wrote or called home after leaving in 1902, Grandpa Breslin never forgot the ways or politics of his homeland. 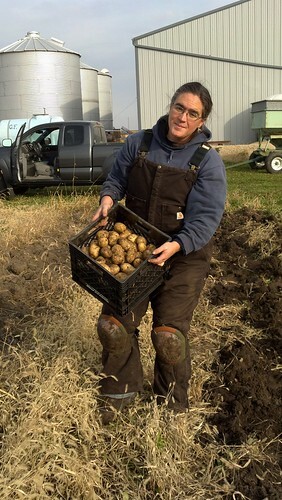 When he was an old man and my dad, his grandson (then called “Jack”) was about 6, Grandpa Breslin would give him lessons in growing spuds the way they did it at home in Cronkeerin. They would cut the potatoes so that only one eye showed, and then set it on a sunny window sill for a few days until it hardened. Then, the young grandson would help dig a trench in his grandfather’s small back yard on the south side of Chicago, and together they would plant them. In the fall, the young knees would be called on again, and little Jack would dig the potatoes with his grandfather while he listened to stories from the old country. So that’s why we grow potatoes on the farm. And that’s why we do it the old-fashioned way. 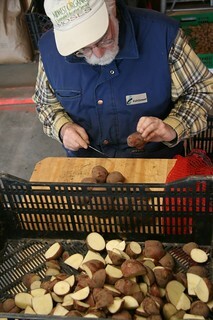 In the early spring, we handle each seed potato carefully, studying it to find the eyes and the best way to cut it. We till the beds and then plant on our knees, crawling down the rows for hours, pushing the potato pieces deep into the soil, being careful to keep the eye pointed toward the sun. 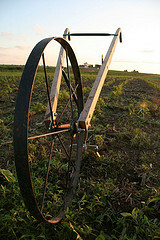 We found a tool that helps with the hilling, an antique ride-behind that my dad has fixed up as a labor of love. John drives the tractor while Molly rides and operates the hilling implement. The tool does the first pass, uprooting weeds and loosening the soil. 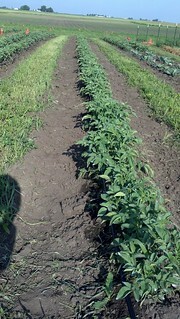 Then we walk the rows, carefully pulling the dirt up with a hoe to make a perfect hill along the potato plants. We scout the potato rows daily when the Colorado potato beetles make their debut in the spring, treating with diatomaceous earth, ground up shells from tiny sea creatures that dehydrate the insects from the inside out. We apply the DE carefully, trying not to hit any other plant or insect matter to limit its effects to the potato beetles as much as possible. At harvest time in the fall, the only tool we use is a potato fork. It’s a two-person job: my dad does the digging, carefully wielding his father’s garden fork. 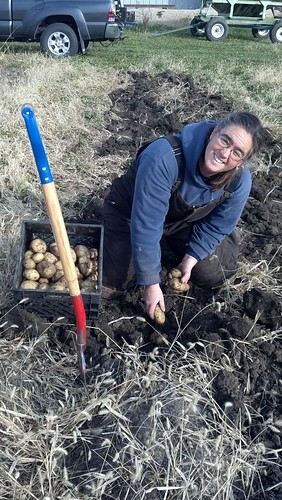 I crawl along the row after him, snagging the potatoes as soon as they are revealed, digging through the loose dirt with my bare fingers, searching for that firm, round shape, pointing out where I think there might be more gems hidden beneath the hill and its thin cover of weeds and dead potato stalks. As I paw through the damp, rich soil, I unearth all manner of other things: dandelion roots, overwintering larvae, discarded exoskeletons. “Huh, wonder what that is,” I say. “Think it’s a beneficial insect?” Every once in a while we accidentally disrupt an ant nest and send the workers scurrying hither and yon, tiny white eggs held high. This is one of the most visceral connections to the land, swathed in layers of warm clothing, crawling through newly-turned dirt in search of food. We will eat that food, simply cooked, the next day and through the winter. After a while, there’s really no need to talk, but I still say, “Ooh, a good one!” whenever something fist-sized or larger turns up, or “Jackpot!” when we find 5 or 6 good-sized potatoes on the same plant. And sometimes my dad tells me about when he used to do this with his grandfather, roles reversed, when he was the one crawling along on the potato treasure-hunt. 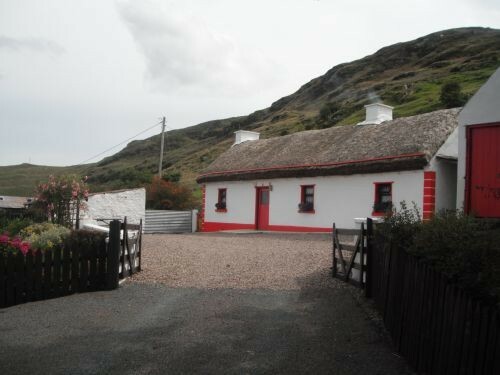 Years later, in 1974, my dad and his new bride traveled to Grandpa Breslin’s first home in Ardara, County Donegal. There he found his second cousins growing up in the same thatched cottage where his grandfather was born and planting spuds in the same patch that his grandfather had used. Now you can rent that same cottage from our cousin Laurence, who has become a good friend of my dad’s. 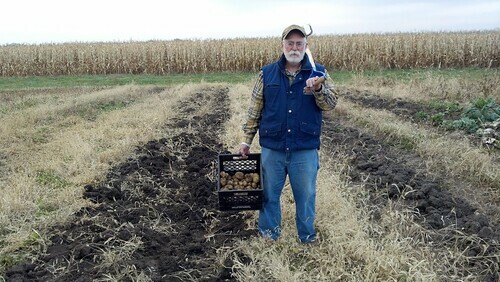 In fact, we took these pictures when we were digging the spuds just to send to him. 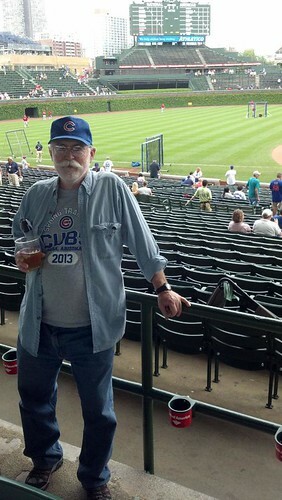 Even though the backyard of that house on the South Side is gone, sacrificed to the Dan Ryan expressway, our connection to Grandpa Breslin and the old country live again every time we tend to the spuds. Our neighbors may think we’re crazy to be out here in the cold, my dad straining his aching knees and me crawling around in the dirt. They probably buy their potatoes at the grocery store like most folks nowadays. But I love it. What is a “weed,” anyway? It has been rather damp on the farm this spring. 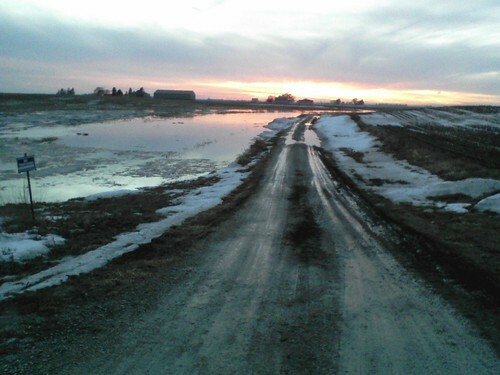 Entrance to the farm on the morning of April 18, 2013. The good news is that the 2012 drought is over! 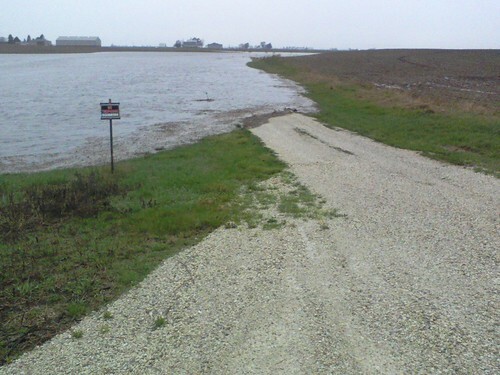 (That didn’t officially transpire until the rain event in April after which the above photo was taken, when we got 5 inches of rain in 24 hours.) The bad news is that planting has not been proceeding at our desired pace. What’s a girl have to do to get just three or four days in a row without rain these days? We’ve been keeping ourselves fairly busy with other, less urgent tasks, but today I mostly wanted to just sit around and watch the fields dry in hopes that would speed up the process. Turns out that’s kind of like watching a pot of water boil on the stove…but slower. To distract myself from our inability to do the one thing that REALLY needed doing, I turned to the one farm job that is best done when the ground is damp: pulling weeds by hand. Who said waiting can’t be fun? The day was sunny and not too hot, about 65 degrees, and the honey bees were having a major nectar-drinking spree in the Dutch white clover in the lane next to the garden plot. Stepping out of the shed in the still of the afternoon, we could hear a gentle hum as they worked away, sucking up clover nectar and then bee-lining back to the hives to pass it on to others who would dehydrate it into storable honey. I tucked in my pants so as to avoid an accidental bee up the knee, and also to gain “farm style” points. I had my eye on the garlic patch. We planted 5 beds of garlic last fall, and we mulched most of them with straw to keep in the warmth and moisture and to keep down the weeds. Despite our best efforts, some pesky Canada thistles have infiltrated the beds and are mooching that warmth and moisture. Wikipedia informs me that these nasty buggers are also called, hilariously, “Cursed thistle” and “Lettuce From Hell thistle” – and that they don’t originate in Canada. 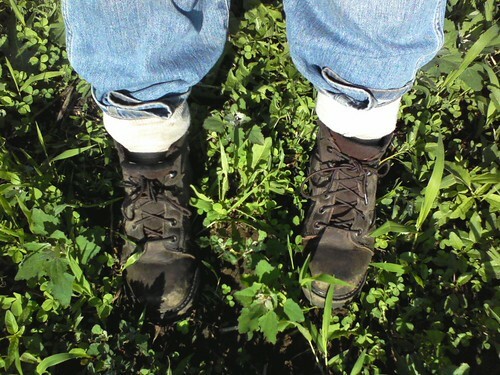 My dad found me some leather gloves on the work bench and I tucked in my t-shirt to avoid that terribly inconvenient lower-back sunburn, touched my toes, and went to town pulling thistles. They came up nicely, mostly with at least 8 to 10 inches of root attached. 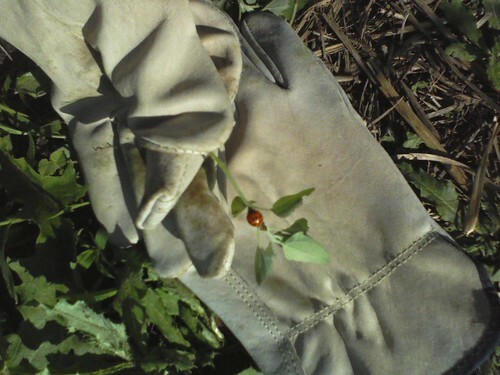 As I worked, I noticed quite a few brilliant red ladybugs in the area. (Wikipedia now tells me that ladybugs are not bugs. Nothing is as it seems on the farm.) The, ahem, Coccinellids were all on the thistles – none on the garlic. Looking closer, I realized that the thistles, especially the smaller ones and those growing in bunches, were covered with tiny green aphids, and the ladybugs were eating them. Beneficial insects at work on the farm! Hooray for biodiversity! 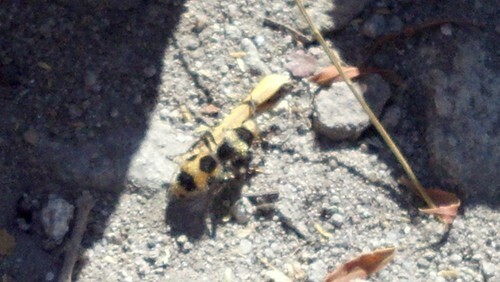 Not a true bug, and I don’t know whether it’s a lady. As I bent to tug at the next thistle, I started thinking about this combination of organisms: the host plants, the pests, and the beneficial predators. First I wondered whether we had let the thistles go too far – they were growing aphids! Would those aphids move to our tomatoes and peppers, which were already weakened by the cold and damp growing conditions? Then I wondered whether the thistles might be attracting the aphids away from the garlic, or even away from the nightshades (tomatoes & peppers). Then I considered the ladybugs…surely with all these aphids to feast on, the ladybugs must be multiplying. Maybe as a result of the aphid plenty, which were a result of the thistle plenty, which were a result of my procrastination on this prickly job, the beneficial predatory ladybugs would be plentiful and ravenous by the time our vegetable crops needed help fending off aphids. So…does that mean that maybe I should leave the thistles, so that the aphids can multiply, so that the ladybugs can multiply? And come to think of it, dandelions are a great source of protein for honey bees. And another farmer told me that lamb’s quarters are good organic matter for building soil tilth. And Japanese beetles seem to prefer velvetweeds to the leaves of most of our crops, and milkweeds feed monarch butterflies, and mustards fumigate the soil between dry bean crops. Maybe I never have to weed again! Let’s just say that after this I felt pretty good about only pulling the thistles that were actually in the garlic beds and leaving the much tougher ones in the rows. I’ll get them later with the mower…and in the meantime, they’ll help me raise ladybugs. The giant ragweed has to go, though – it makes me too itchy! 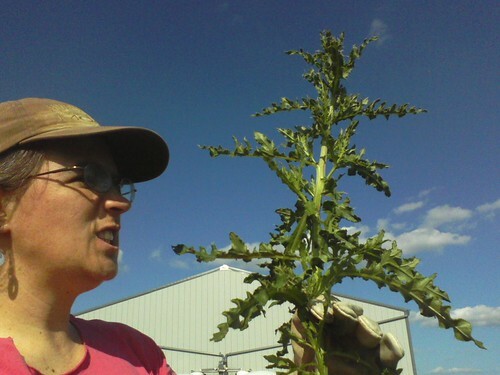 Update, February 2014: Maybe I was wrong about the giant ragweeds. 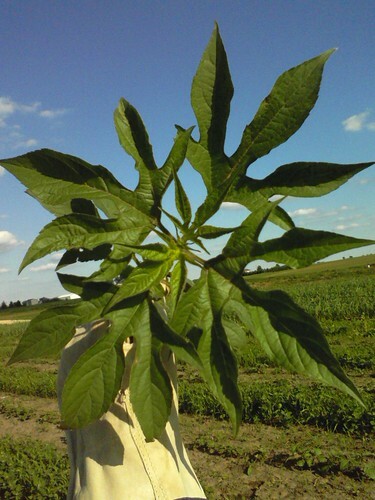 Check out this article about its strengths from Gene Logsdon’s blog: The Irony of Giant Ragweed. True Farmer Confessions: My camera stopped working last May or so, and as equipment repair goes, well, I guess it wasn’t a priority. The phone cameras just don’t do the farm justice and I’m not as excited to share those photos, so I’ve been procrastinating…excuses, excuses. In early 2012, we realized that our winter wheat acreage wouldn’t yield enough to satisfy our customers, so we make a quick-change and decided to try out some hard red spring wheat. Molly loading spring wheat into the grain drill. The weeds were harder to control in the spring wheat than in the winter wheat, and it didn’t yield as well as the winter wheat. Because of the drawbacks, and because some of our baking customers prefer the flavor and “behavior” (I don’t know how else to describe it) of the winter wheat, we will probably try to stick with winter small grains in the future. Overall, though, we decided that we made the right decision at the time. Without those extra 3 acres, we would have been plumb out of wheat by now! In addition to our little plot of sweet corn, 2012 saw our first crop of field corn, plain ol’ #2 yellow. John, planting corn in the early morning light. 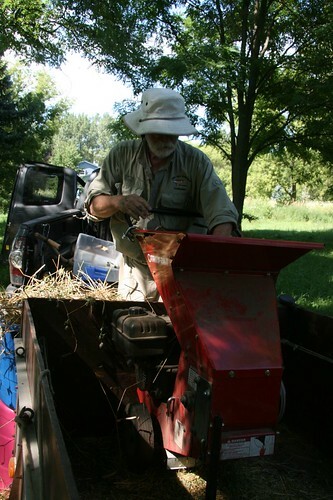 Most of the corn ended up as organic layer feed…meaning, as eggs! Some was sold to local farmer friends as a feed or feed supplement for their animals. We’re planning to eat some of that corn as pork this fall. We significantly increased our acreage of our heirloom dry beans, especially the Tiger’s Eye (2 acres) and Black Turtle (4.5 acres). Molly, checking out newly-emerged Tiger’s Eye beans and ignoring the ironweeds. We thought that was a lot! (We started with just 1/4 acre of each of those varieties a few years ago.) But now, 6 months after harvest, beans are almost out of stock. Another new experiment for us this year was a food-grade soybean. Like corn, most of the soybeans we see in the fields as we drive around Illinois aren’t eaten by humans. The bean we grew this year was a tofu-grade bean, a larger bean with a higher protein content than a standard soybean, and a clear hilum. The clear hilum (the belly-button where it connects to the plant) is important because the normal dark hilum would lead to black-flecked tofu or soymilk. 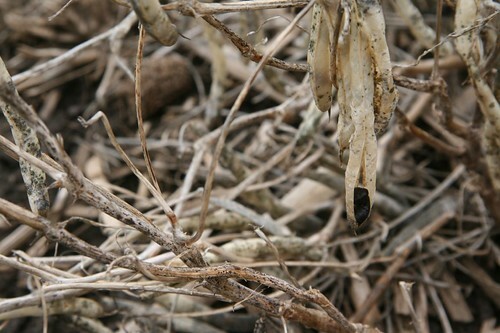 The dark hilum is visible on the standard feed-grade soybeans in the photo to the left. We got lucky with the soybeans: the family-owned organic seed company who had developed the seed, Blue River Hybrids, called us in the fall to ask whether they could buy back our crop to use as seed for next year. The seeds had to go through a 7-day battery of tests, including very rigorous testing to make sure they were GMO-free, and they passed! 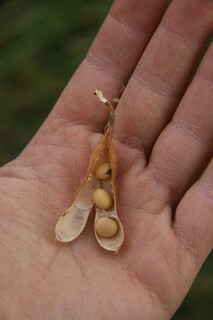 That success went to our heads, and we’re planning to grow more of these beans in 2013. 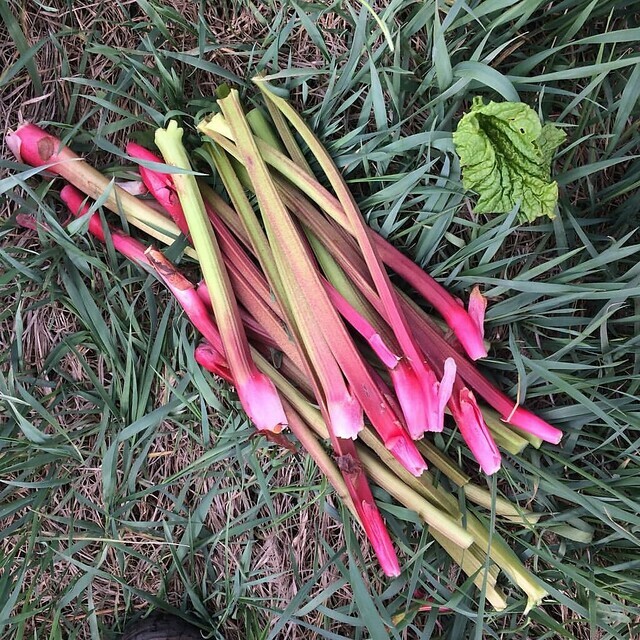 Almost 5,000 heads of hard-necked garlic were harvested in July, after we’d picked and sold off the scapes (garlic flower stems, a delicacy if you ask me) in June. If you live in the midwest, you may remember that it was really warm last March. Folks were at the beach in Chicago on St. Patrick’s Day. The cold weather that followed in April may have been less memorable. 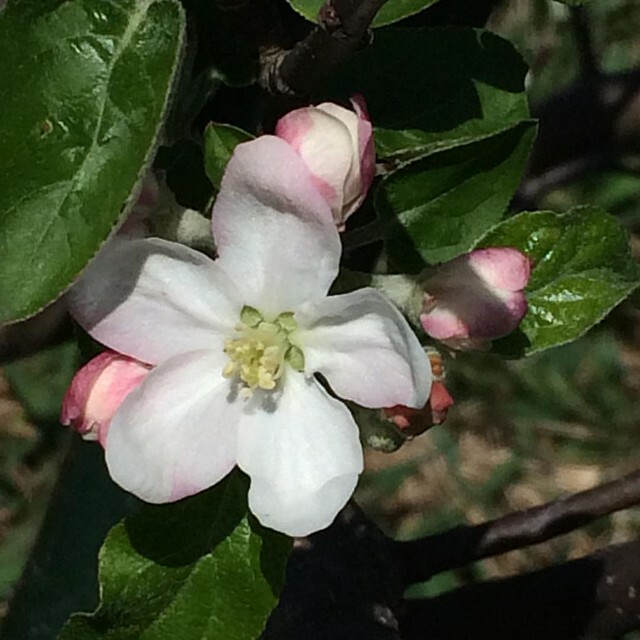 It turned out to be devastating for the apple farmers, as the apple trees bloomed early and then had most of their blossoms killed off by later frosts. We had our own scare with the wheat, which could have the heads killed by a frost too late in its development. 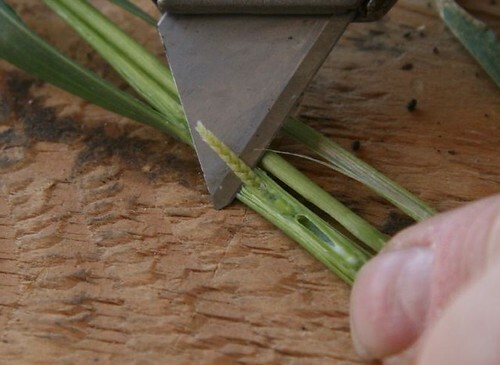 To find out if our wheat was okay, we had to slice open the stems and look to see whether the heads were still alive and growing. Tiny wheat seed heads still in formation inside the stalks, green and healthy. Luckily for us, our wheat survived. The ensuing drought lowered our yields on the wheat a bit, but the wheat was past its major moisture needs by the time the drought really got bad in July. Our corn wasn’t as lucky – it didn’t pollinate well because of the high overnight temperatures, and our sweet corn yields were about 10% of expected. 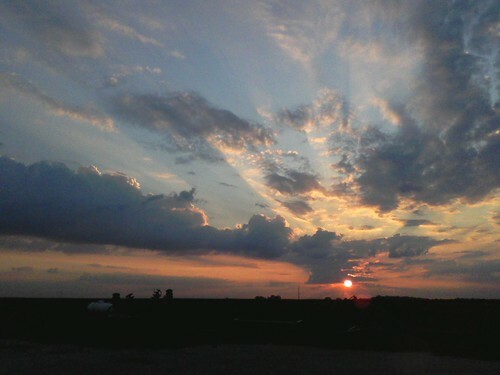 Rain began again in mid-August, in time to save the soybeans and dry beans. We were visited by a reporter and a camera man from Al Jazeera English in September to see how we were coping with the drought. Click on the photo below to watch the piece that featured Molly’s interview. 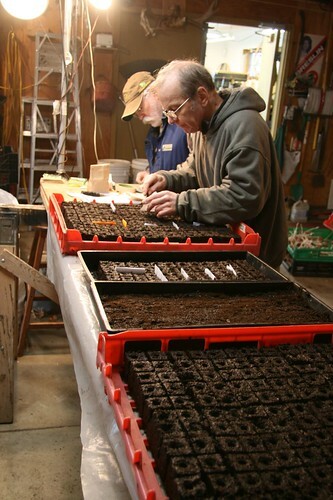 After keeping careful records for 3 years, several phone consultations with the good folks at MOSA, and a couple of winter days locked in a room together with a computer, we put in our initial application for organic certification in March of 2012. 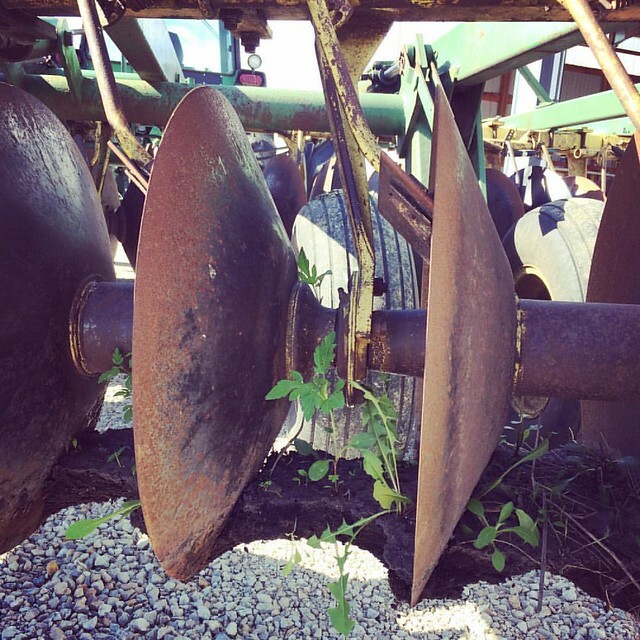 In July, an inspector came to our farm to inspect the farm, equipment, and our records. More documentation flew from Ottawa to Wisconsin by email. Then on August 4th, exactly 36 months and one day after the day we could certify that no further prohibited substances were applied to the fields, we officially became a USDA National Organic Program Certified Organic farm. 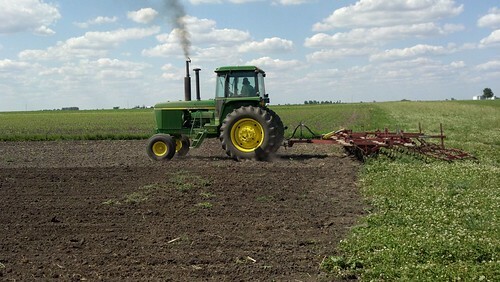 Molly cultivated her first field with our “new” (1976) tractor in June. It has a cab, which means less dust and noise…and climate control. Fancy. 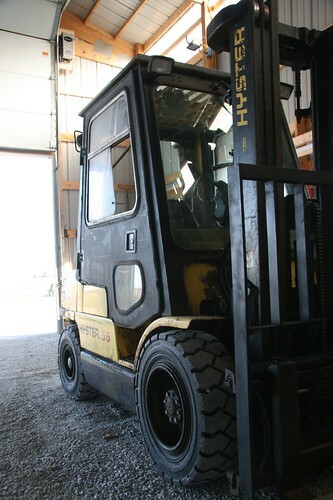 A new (again, used) forklift allows us to store and deal with large pallets and hoppers of grain. 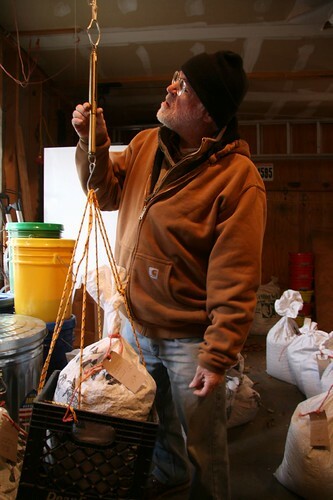 Moving 2,000 pounds of wheat no longer means lifting 40 bags, one after the other, and shifting them by hand. We later figured out that this kind of forklift only works on gravel that has been packed down by years of use, so we got really good at pulling it out of holes with the tractor. Later on, we put in concrete in part of the shed so that we could avoid that extra step. Our friend Clyde (above) helped us start our vegetables in the garage, and then he came back later to help plant them out in our garden test plots. 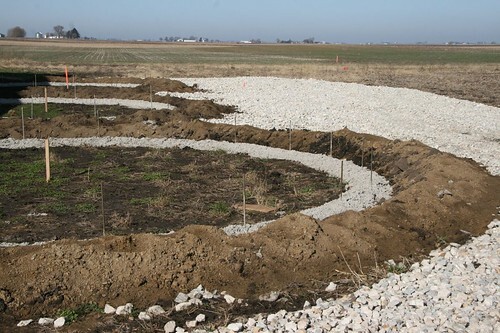 The hard-working crew planted dozens of trees in our low-lying native wetland rehabilitation area. That’s most of the excitement from last year. 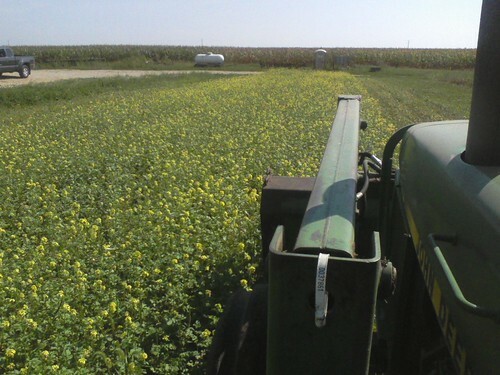 I promise to try to get my trusty Canon fixed before the 2013 planting season really kicks into high gear! They’re grain bins. Big cylinders that rise high overhead out in the country. What’s the difference? Grain bins are basically just big buildings that are filled with grain for storage. The basic idea goes back to when Joseph (of multi-colored-coat Biblical and Broadway fame) was working in Egypt and recommended that folks store grain during years of good harvest to eat in lean years. Since we’re participants, like it or not, in a worldwide grain-trading economy, we put crops in the bin in hopes that we will be able to sell at higher prices after the harvest-time glut. Bins are usually cylindrical and metal, with conical metal roofs. They are used to store whole grain between harvest and use or sale. 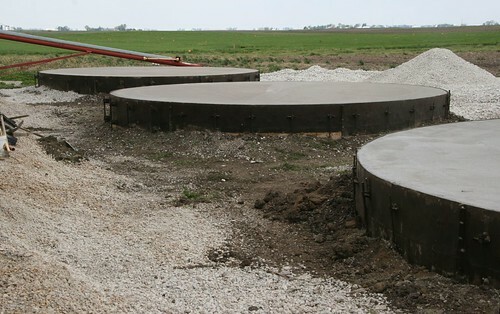 Silos, on the other hand, are often made of thicker material such as concrete or fused glass and steel because they need to be very strong and airtight in order to contain fermenting grain and sometimes other plant matter (called “silage”). The fermentation process renders it digestible for livestock. The cylindrical metal structures that are made of a metal mesh that you can see through are corn cribs (which come in many other shapes and are often made of wood) – those are used to store whole ears of corn. Cribs were more common before combine harvesters, when dry corn ears were picked whole and then slowly shelled (had kernels removed from the cob) as they were needed. 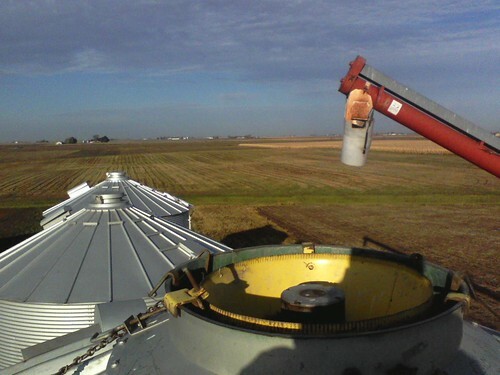 Over the course of several months in 2012, we put up some bins on the farm. And when I say “we,” what I mean is that we purchased used bins from a neighbor and then hired professionals to deconstruct them, move them a mile and a half down the road, and reconstruct them next to our shed. 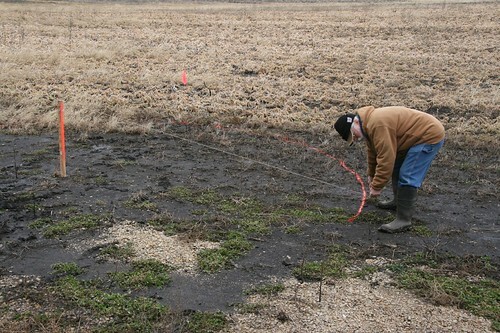 In the muddy days of February, we measured and laid out the bin footprints. We hired some friends to help dig the and pour concrete footings for the foundations, which had to be about 2 feet deep and stocked with re-bar. 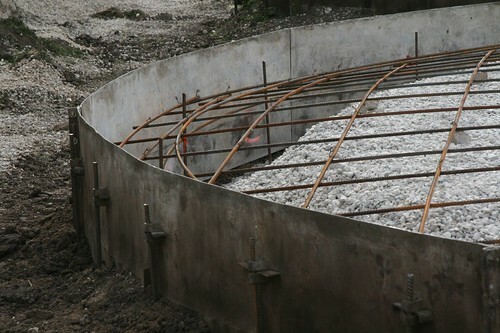 Here’s where the professionals come in: metal forms were placed around the foundation-to-be, and a beautiful maze of re-bar and wire was balanced on chunks of broken cinder blocks to reinforce the concrete. Then one day as we were working on the west side of the shed, all of a sudden, the top of a bin came driving around the corner of the lane. It was surprising and magical, like seeing a walking house! Re-construction took some time, as the crew would come for a day and then go to work on a more urgent job. That was fine with us – we didn’t need the grain storage until July (for wheat) at the earliest. Once the bin tops were in place on the foundations, they would be lifted with jacks so that one sidewall band could be added at a time. Wind was a serious concern, so they had to be re-fastened to the foundations between workdays. Bins in varying stages of completion. 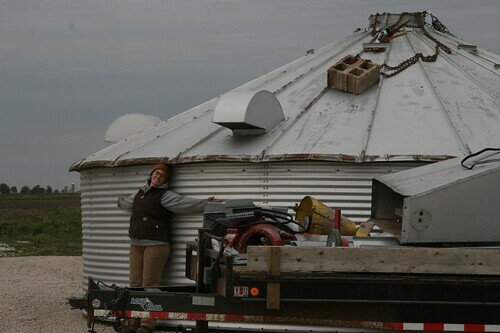 Our new/used grain bins had come from a neighboring farm where they had stored grain that was not certified organic. When they were finally complete, we had to clean them to the best of our ability in order to prevent contamination from the conventional (possibly GMO) former contents. Since water and dust make a pasty mess, we decided to use abrasion and air. This meant that I took an extension ladder inside each bin and manually brushed every inch of the interior walls, from the top down. When I had brushed as much as I could reach from one position, I would use an air compressor nozzle to blow the dust down to a lower level, climb down, move and reset the ladder, and then climb up to do another arm-width’s worth of cleaning. 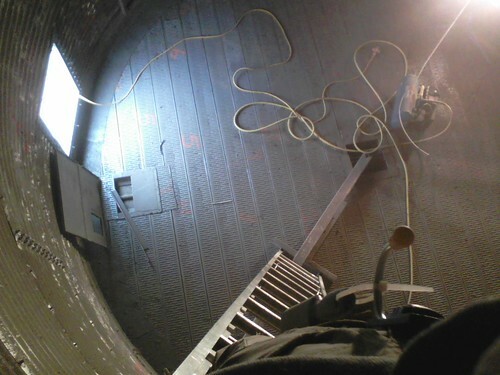 View from the top of the ladder inside the bin. You can see the gunk on the walls below. 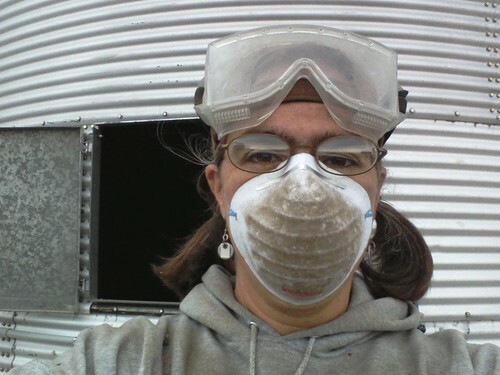 I had to change my dust mask every few hours while cleaning the bins. Everything was clean and closed up, with electricity and moving parts installed and tested, by the time our soybean crop was ready for harvest in October. Soybeans moved from left to right in the photo below, from the wagon to the rotary seed cleaner and then via big red auger up to the top of the bin. Soybeans being cleaned and loaded into the new bin. 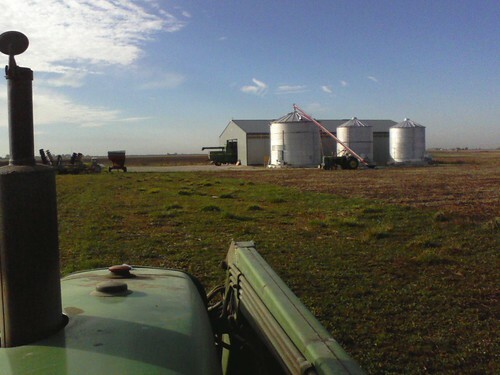 Side note: The gravity-feed grain wagon (pale green, to the left in the photo above) was a product of my first solo trip to a farm equipment auction. Holy cow, auctions are nerve-wracking! I was lucky that my friend Rob Montalbano happened to be there to calm me down and bolster my confidence. 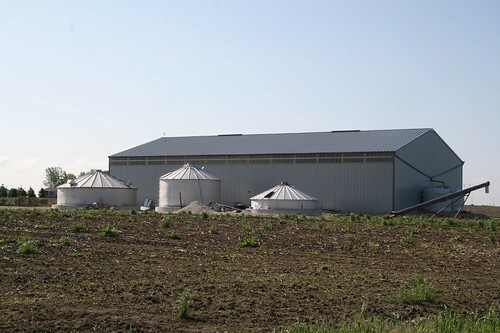 Our largest bin can store up to 6,000 bushels (168,000 tons) of corn. 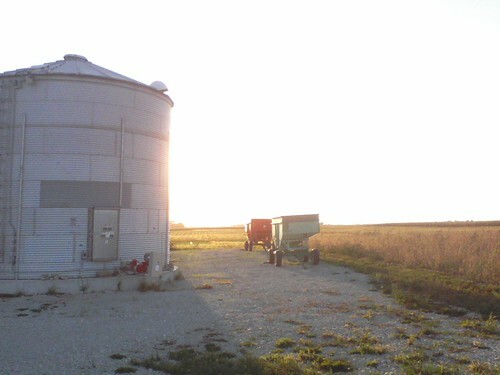 The two smaller bins hold 3,000 bushels each, and they are used for soybeans and either dry beans or wheat. 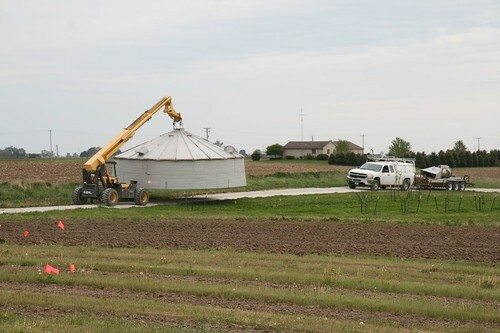 With 12,000 bushels of storage space, we now have much greater control over the sale prices of our grain. Being able to store grain also increases our ability to sell grain locally: since we can keep it on hand, we can now sell a little at a time to more individual end-user customers. 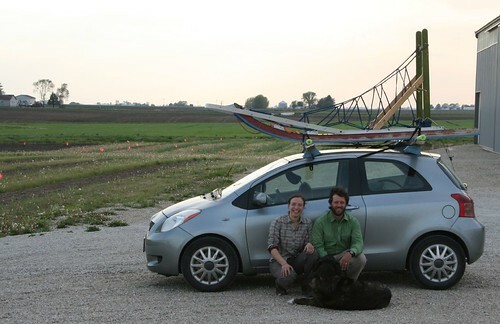 Eventually, we would like to be able to sell all our grain to local folks this way. Added perk: the top of the bin offers a beautiful view of the farm.